Estimated payment based on 12.95% interest rate. Actual monthly payment may vary. 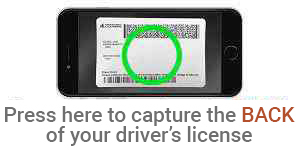 Please take a picture or upload a copy of the front of your driver's license. We're sorry you have declined to use our automated prequalification system. If you prefer, please stop by our nearest retail location to apply.